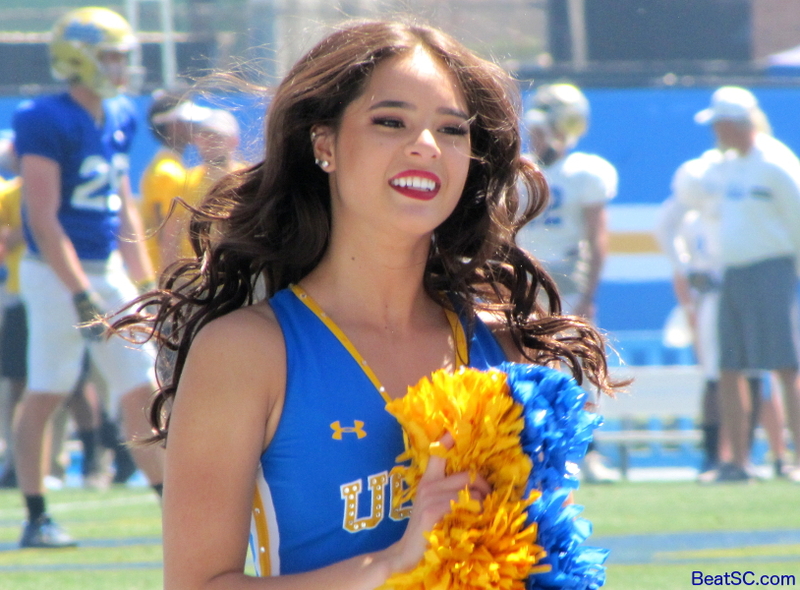 Congratulations to the Bruin Gymnasts, for garnering UCLA’s 115th NCAA Title, and congratulations to the UCLA Baseball team, for annihilating the trojans 19-2. 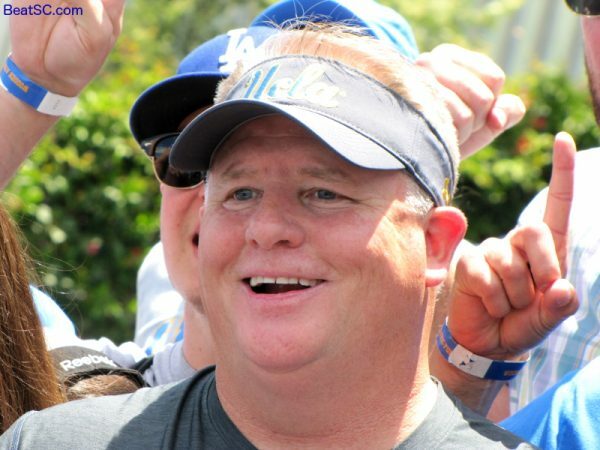 But most UCLA Sports fans are more interested in UCLA Football, which is the Talk of the Town now that superstar Head Coach Chip Kelly is in charge. Chip Kelly’s juggernaut Offenses at Oregon were known for speed/pace, and misdirection. The opposing team was always on their heels, and never knew who had the ball. 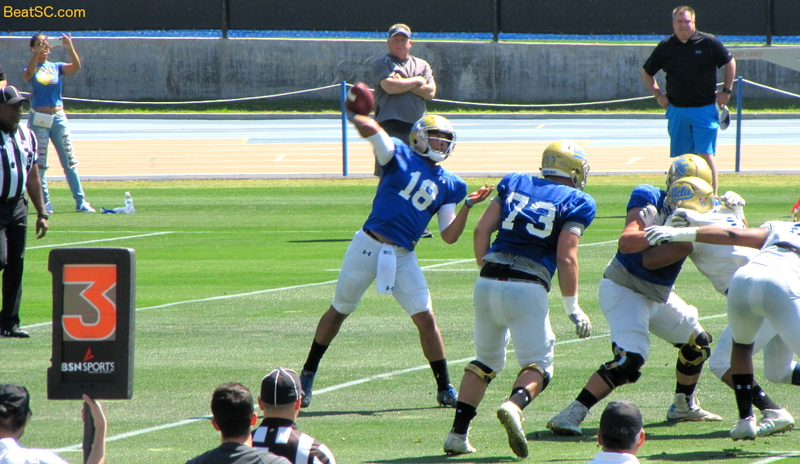 Unfortunately, there was no sign of that in Saturday’s UCLA Football Spring Showcase Scrimmage. Don’t panic, as it is probably way too early to expect to see the Kelly trademarks already clicking in Westwood. Give him a chance to implement his system. By the Fall Scrimmage, I am betting that we will be seeing more trickery, better execution, and flashier results. Speaking of flashy, here are a few photos from the Showcase. Please come back tomorrow for a MUCH larger batch of pics, also from this showcase. [Sorry — I was busy all day and night, and didn’t have time to do a full batch immediately]. 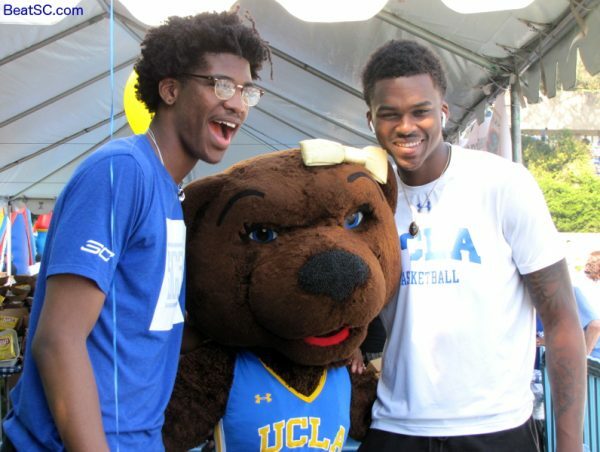 Basketball Bruins Chris Smith and Kris Wilkes pose with Josie. I hope this is a good sign that Kris is returning for his sophomore year! I hope Emily never leaves! Just my 8 favorite pics of the day. Up above the article are Head Coach Chip Kelly, and the beautiful Jennifer of the Cheer Squad, who has been tragically under-represented over the last year (just by happenstance/logistics). Anyway — It’s 5am. I will post dozens more photos from this event asap, within 24 hours for sure. "VANILLA CHIP AND CHAMPIONSHIP" was published on April 22nd, 2018 and is listed in Blue & Gold News, News from the Dark Side, UCLA/usc/Cheerleader Photos, UCLA/usc/Sports Photos. Watching replay of gymnastics now. UCLA coming from beind as the UCLA ladies nailed the bars, especially Peng-Peng Lee who scored a perfect 10. I wish I didn’t know the final outcome already. A perfect 10 on the beam from Peng-Peng Lee in the final performance of the competition to win it for UCLA by .0375 over Oklahoma.